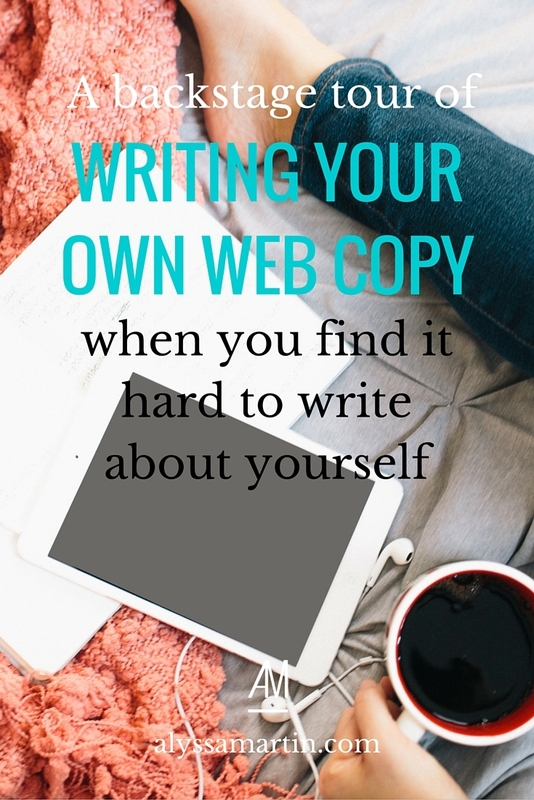 Writing your own website content is a chore. For everyone. You’re not alone, my friend. Am I being too wordy? Is my message getting across? It’s a downright struggle to write about yourself in that way because it feels so personal. You can’t be objective about it or distance yourself from the result because it feels like your website content is a reflection of you. I struggle with the exact same thing because, like you, I’m human. So, today, I’m going to give you a backstage tour of the 13 steps that I took to dramatically re-write my entire website in the lead up to my upcoming rebrand. These came as I was watching tv, talking to a friend, reading a book, flicking through social media. Anytime someone said something that made me think, “Hell yes! That’s what I’m all about!” I made a note of it in Evernote. They were quotes or general ideas that typically only lasted a sentence or two. I only wrote down things that gave myself the shivers. The most powerful of powerful messages. These things packed a punch. Then there were other ideas that were more fleshed out & were full paragraphs with really pointed messages. They helped me hone my ideas & get clear on what I truly wanted to say. I checked in with my Google Analytics & ConvertKit conversion rates to see what parts of my website were already working really well for me and what weren’t. I discovered that, even though my about page is long, it was converting at 10%. That meant that 10% of people who landed on the site where giving me their email address. 10% is huuuuuuuge. Conversions for a paid product hover around 1%. If it’s free, you can sometimes get it around 5% if you’ve got a pop up or good conversion strategies. Obviously, 10% is even double that. Armed with this knowledge, I knew that I didn’t need to make many changes to my about page. Simply by checking my analytics I saved myself a tonne of hassle because writing your own about page is haaaaaard (even if you’re a copywriter – because writing about yourself is ALWAYS hard). I wrote out anything and everything that I wanted to say or that my dream clients want/need to know. Absolutely everything got pulled out of my brain and put on the page. No stone left unturned. If it popped into my head, it got put down on paper. There was no specific structure to all this, but I did try to group all the ideas together. Sometimes, you’ve just got to sift through all the ideas to discover the gold. There was no judging myself or my writing. I wrote it all down whether it was good, bad or in between. Your home page headline needs to quickly articulate your message AND get your dream client’s attention at the same time. It’s prime real estate when it comes to your website content. So can you explain your key message or your core purpose in one sentence? If you can, it might make a good headline. A headline that reflects your core message helps set the tone for your entire website & grabs attention from the right people. It shows what your website is all about right from the get-go, so that your dream clients immediately realise that they’re in the right place. It’s a challenge, but it’s so worth it. I’ve been a cobbler with no shoes. I’ve been giving great advice on what it takes to write copy that makes your dream clients stay on your site for longer & inches them closer to working with you. But I haven’t followed that brilliant advice for myself (because I’m “too busy” serving my clients, right?). So I re-read my own ‘how to write your home page’ blog post & wrote out all the important sections that I needed to include. This gave me a structure to organise all the ideas that I got in my brain dump so that I could figure out what would work & what wouldn’t work. For my services pages, I sat down and mapped out the big picture things my clients would want to know first, second, third, fourth and that became my page structure. Your client’s mindset influences how you structure your website content, especially your services or sales pages. There’s no one-size fits all structure that will suit everyone (which is why all my work with my clients is super customised & personal). Having structure to go by is so helpful when writing website content. Without it, your message can feel jumbled & confused, instead of clear & focused. Once I had my page structure in place, I could piece all my brainstorming together like a puzzle. This bit belongs here. That bit goes over there. My jumbled mess of ideas were starting to take shape & create a clear(er) message. It became infinitely easier to see which ideas worked together in unison and which ones didn’t mesh as well. Good ideas started to get cut simply because they didn’t fit with the flow or structure of the page anymore. All those ideas were cut and pasted into an Evernote file to be used in social media posts, emails & other important places where I share my message. I thought deeply about all the results that my clients get from working with me. After a few months of working on a new service, you’ll be so much clearer about what it helps your dream clients achieve than you were when writing a sales page for a brand new service. That’s normal, which is why it’s really helpful to review your website content regularly. Now that I had a much better idea of how my services are making a difference to my clients, I added that into my sales page in a much clearer, more attention-grabbing way. There’s a lot more confidence behind those results now, so it was fast & easy to write all those down. My services also have a much clearer structure now than they did 3 months ago, so it was easier to explain how the process would flow, step by step; what they’d get out of it; who it’s not right for; and why they should sign up to work with me. Clients love clarity, so explaining your services in intricate detail is a must-do when it comes to writing your website content. Add in anything you can think of that makes it clearer or more concrete & you can pare it back later. I kept only the essential bits. Anything that wasn’t smart, succinct & super relevant got cut. People are busy. They don’t want to read a 1,000 word missive for a web page. They want to land on it & get the gist quickly to decide if they should stick around to read more. Is it on message? No? Cut it. Does it fit with the flow of the page? No? Cut it. Have I already included something similar? Yes? Cut it. Does this get straight to the point? No? Cut it. In short: if it didn’t help me make my point faster, then it got the axe. Step 9: What questions might this website content raise? I thought about all the questions that people have (or should have) about my services. Then, I wrote answers to all of those questions & added them to my services pages. FAQ sections are a huge help when it comes to turning website visitors into clients. Research from Forrestor shows that 45% will decide NOT to buy from you if they can’t easily find answers to their questions. In other words, if you think people will email you with their questions about working with you… they probably won’t. Almost half of them will just leave & hire someone else. Half of your potential clients is a lot to loose just because you don’t have FAQs. Read over your copy & ask yourself what questions a potential client could possibly have. Then, make sure to address those in an FAQ area. Step 10: What’s the next step? Until now, I just wanted my clients to book right in and sign up to work with my in Sartori booking software. So the buttons on my services pages were essentially “pay now” or “book now” buttons. This works really well for me right now, but doesn’t work for higher priced offerings. Since my price for my flagship 7 Week Brand Message Overhaul program are going (way) up in February, I need to give my dream clients the opportunity to chat with me first & get a feel for my style. No one wants to invest thousands of dollars in someone they’ve never talked to before. Plus, talking to someone in real time is a huge trust builder – and we only want to work with folks that we know, like and trust. So, even though I’m writing website content for my rebrand that launches on February 22, I’ve changed the next step from “book now” to “book a clarity call.” I’ll test out how well that process for onboard my dream clients works for me, but I’m very confident about it already. It’s really important that your website content matches your client on boarding process. Clear expectations are priceless. Now I needed to see what all the words in my Word Doc would look like with all the design elements in place. So, I sent it off to my designer to see what worked & what needed tweaking. Are some headlines too long? Are some paragraphs too blocky & need to be shortened, so that they’re easier to read? My designer not only helped me make my website content look good, without knowing it, she helped me see where I was still being too wordy & going overboard. Once I saw the design, I pulled even more words out. Maybe 1-2 paragraphs per page got pruned back to make them even more succinct. By this stage, thing were looking really good & I had just a few small opportunities to make it even snappier. This is happening on February 22, 2016 – the day my rebrand launches. Keep an eye out. It’s a HUGE change for my website & brand (and feels so much more me). You’ll soon see what a big process writing my own website content was once the new website goes live. But if I can do it, you can too!